Jeb Bush speaks Saturday at his South Carolina Republican presidential primary rally, where he ended his campaign. 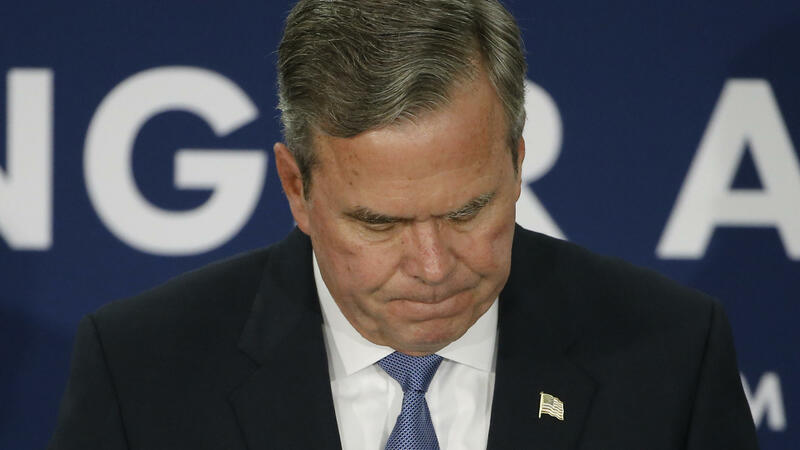 After disappointing finishes in presidential nominating contests in Iowa, New Hampshire and South Carolina, Jeb Bush suspended his campaign for president Saturday night. It was the end of a run that had seemed doomed for months: countless gaffes, merciless attacks from the likes of Donald Trump, seemingly limitless spending from a superPAC he couldn't control with horrible returns from those investments and perhaps, above all, a candidate who seemed uncomfortable on the trail at best, and at worst, frustrated and unhappy. Already, the post-mortems are almost writing themselves. And there are a number of theories as to why "Jeb!" failed in this campaign, especially after being the early favorite with all the conventional advantages. All of these theories, of course, acknowledge the effect of Donald Trump, the surprising success of his campaign and the damage his relentless attacks on Bush inflicted. But there are other reasons, as well. 1. Not really the choice of party leaders: Bush, initially thought to be the choice of the Republican Party establishment, was actually never the clear pick. 2. Kasich also filled the policy wonk lane: John Kasich of Ohio filled the role of policy-oriented, agreeable and sensible Republican candidate much better than Jeb Bush did. 3. Bush fatigue: Everyone underestimated it even within the party. 2. TV's decreased influence: It also argues that the Bush campaign "miscalculated the role and power of money and traditional television commercials in the 2016 race." Basically, Bush's team thought what worked 20 years ago — or even last cycle — in presidential campaigns could work today. But the rise of Trump, and his strategy of using earned and new media (just look at his Instagram) made much of those old practices obsolete. 3. Outdated campaign/message: And that leads to the third reason — running "a campaign that, whether deliberate or not, was rooted in the past, managed by loyalists who admired Bush and enjoyed his confidence but who, like the candidate, found themselves in unfamiliar political terrain." The article names several Bush operatives who allege the campaign had no clear strategy, no one really in control and no real way to deal with a political terrain vastly changed from the last time Bush ran for office. And they waited, the article claims, perhaps too long, to fully engage Trump. But, Bush, in his loss, symbolized much more than just a failed candidate to some. At NBCNews.com, Benjy Sarlin argues that Bush's campaign suspension recognized the failure of an entire generation of the Republican Party. "This was a candidate who stood for an entire generation of Republican Party building, who was the figurative and literal heir to the family brand that had graced nearly every GOP ticket for a generation," Sarlin wrote. He continued, "And he ceded the race to a candidate whose campaign was a walking insult to his family legacy and everything Bush's supporters told themselves the party stood for." Sarlin said Trump entered the presidential race, and re-entered the Republican Party, at a time when Tea Party momentum had taken over, spurring the rise of Marco Rubio and Ted Cruz. When other candidates dropped out, they were easy to forget. They quickly faded away. You got to stop thinking about them. But with the Bush post-mortem, there seems to be a desire to know more, to wonder what happens next or how his family accepts the news, what Barbara and George W. all have to say about it. Perhaps Matt Latimer at Politico put it best. "I can't help but think about this coming Easter or Thanksgiving," he said, "or the next event when the whole Bush family is gathered around in one place." Kerric Harvey, editor of the Encyclopedia of Social Media and Politics, spoke about this before with NPR, when she noted why it has been so easy to make fun of Bush during this election. "The thing about Jeb is, he's actually already his own political meme," she said. "He starts life as a political meme, because he comes to the digital world dragging his family behind him, his analog family story behind him. He cannot be separated from his own narrative." And that might really sum it up. The story of Jeb Bush in this election has always been about much more than just Jeb Bush. It has been about his entire family, and whether one name should have that much control over the presidency. Or whether his brother's war in Iraq was justified. Or whether his mother, Barbara, should actually run for president herself. Or whether he was Bush enough. Jeb Bush is a character in the ongoing soap opera that is his family, but also of the Republican Party, its direction and what Republicans want. And it seemed he never got to control the plot or write the script. He was neither the hero nor the villain, but instead the character you're supposed to pity, the one always in someone else's shadow. He was a supporting actor in a show that was never really about him in the first place. And that's rarely a place where winners reside.